Taxi fares are around the same as they were at the old Don Muang airport, and possibly cheaper at around 250 baht to the Sukhumvit area including the 50 baht airport surcharge. Tollway costs are 65 Baht extra, making a total of 315 Baht. Khao San Road is going to be more because it’s further away – probably around 300 baht plus the 65 Baht for the tolls. The driver will ask you for the tollway money so it helps to have some change, but he will cover it if you don’t. Just remember to add the tollway charge and the airport surcharge to the final meter amount. You can book Bangkok hotels online – if you’re looking for Khao San Road hotels, have a read of Best Cheap Hotels in Bangkok and see the Khao San Road Quick Guide. Taxi times to Bangkok are very variable, depending on what time of day you travel. Expect it to be an hour’s journey, possibly two hours if you hit Bangkok during rush hour. Make sure you leave plenty of time to get to the airport when you depart from Thailand, especially if you are travelling on a Friday afternoon when the city regularly becomes one huge gridlock. For Pattaya, taxis are charging a flat fee of 1300 baht one way and that the journey is one and a half to two hours, again depending on traffic. This flat fee INCLUDES highway toll payments. 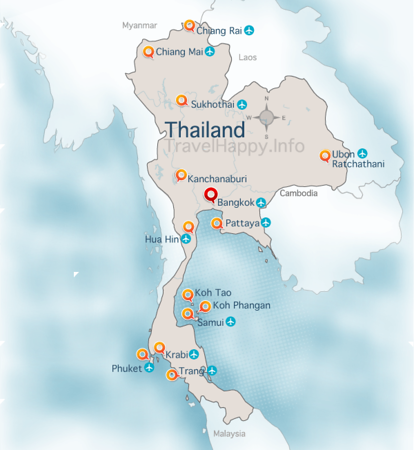 You can also book Pattaya hotels online. When you emerge into the Arrivals Hall, bear directly right and then turn left outside of the terminal. The Public Taxi queue will be pretty much in front of you. You will be assigned a driver and given a paper chit before the driver takes you to his cab. When in the Arrivals Hall, you will be approached to take an expensive Limousine service into Bangkok – around 1000 Baht. Ignore these guys and head outside. The bus is located downstairs. Turn right from the Arrivals Hall and go down the escalator. The Airport Bus express operates 4 bus routes to downtown. The cost is 150 baht for entire route. To get to Khao San Road, you need AE2. Bang Lamphu is the district in which Khao San Road is located. At 150 baht per person, it’s probably cheaper and certainly easier to get a cab if there are two of you. The Bangkok Airport Rail Link is now open – follow the link for full info on the service. It’s a good option if you’re staying somewhere in the Sukhumvit area.